‘Tis the season for working in the garden! 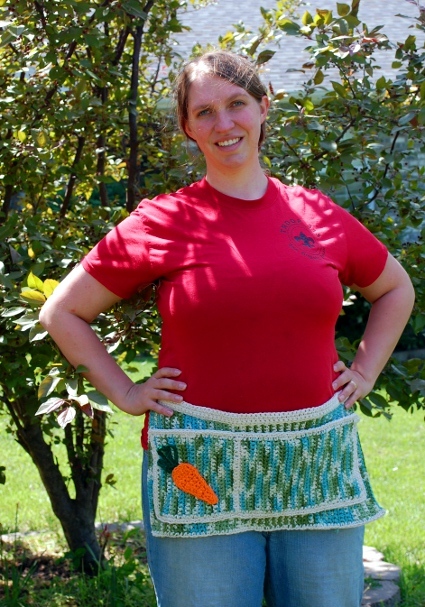 But just in case you don’t want your seed packets to get all muddy or go back to the house for the twine (again) here’s a simple little apron with big pockets and a vegetable garden kick that would make a great gift for your favorite gardener. Of course, no one says your favorite gardener can’t be yourself! 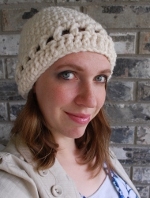 Gauge: 14 sts/16 rows = 4″ in sc. Repeat Row 3 until work measures 17″ or desired width, minus 1″. Ch 1, sc in each st across, finish off. Row 1: With CC, ch 22″. Join to corner of Apron and sl st across edges of rows (long side); ch another 22″, turn. Row 2: Sc in each ch and sl st across, turn. Rows 3-4: Ch 1, sc across. Edging: Join at bottom corner of Apron with CC, ch 1. Sc evenly across. Finish off. Row 1: With MC, Ch 21. Sk 1 st, sc in each ch across. (20 Sc) Turn. Row 2: Ch 1; sc in each st across. Turn. Repeat Row 2 until work measures 6″ from start. Switch to CC, ch 1, sc across. Turn. Ch 1, sc across, turn. Switch back to MC. Repeat Row 2 until work measures 16″ from start. Switch to CC. Ch 1, sc across until 1 st remains; place 3 sc in last st to turn corner. Evenly sc across side (placing 3 sc at next corner), sc across side until 1 st remains, place 3 sc in corner; evenly sc across side, join rnd. Do not turn, ch 1. *Sc in each st across until center-st of sc3; place 3 sc in this st. Repeat from * around, sc, join rnd. Finish off. Row 1: With Hot Orange, ch 4. Sk 1 ch, make 2 sc in each ch across. (6 sc) Turn. Rows 2-3: Ch 1, sc across. (6 sc) Turn. Row 4: Ch 1, sc dec, sc 2, sc dec. (4 sc) Turn. Rows 5-7: Ch 1, sc across. (4 sc) Turn. Row 8: Ch 1, sc dec, sc 2. (3 sc) Turn. Row 9: Ch 1, sc across. (3 sc) Turn. Row 10: Ch 1, sc dec, sc. (2 sc) Turn. Rows 11-12: Ch 1, sc 2, turn. Row 13: Ch 1, sc dec. (1 sc) Turn. Row 14: Ch 1, sc. Sl st around enire outside edge of carrot; finish off. With Green, ch 15. Sl st in 1st ch made, ch 15, sl st in same ch, ch 15, sl st in same ch. (3 chain-loops.) Finish off. Sew carrot top to carrot. 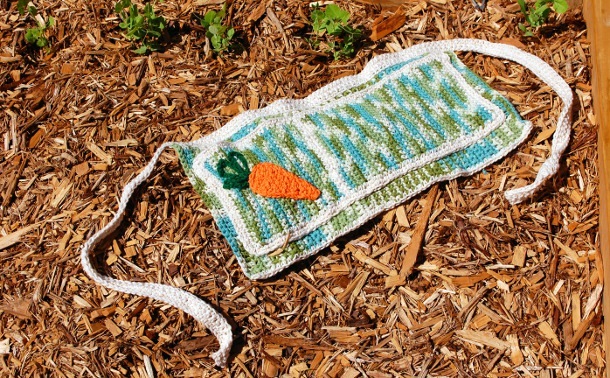 Sew carrot to smaller side of pocket. Sew pocket to apron, sewing down sides, bottom, and the CC strip between the two pockets but leaving the top open so you can put things into them.